A pretty standard standard Spaghetti Western with good production values and a decent script. UK R2 C'est la Vie DVD. 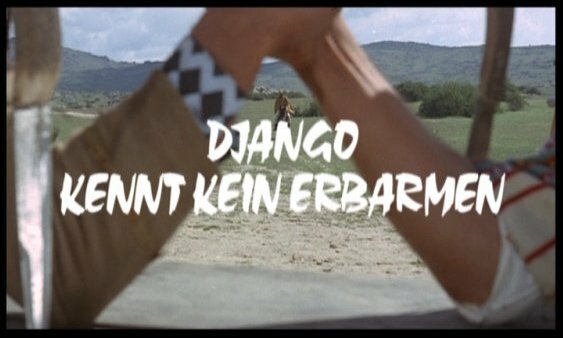 1966 was the most important year for the Spaghetti Western, it was in this year that the genre really kicked off, with Sergio Corbucci's famous Django (1966) setting the way for the myriad of films to come. The film opens with bounty-hunter Regan (dubbed as Django in many releases of the film) collecting a kill - a member of the notorious Norton gang. He returns to his employers and they inform him that the gang-leader Jim Norton has been killed but that two of the men are still at large. Regan (Anthony Steffen) heads up to Montana to find Norton's twin brother Trevor, in the hope that he could throw some light on the situation, but Montana is at war; the cattle ranchers battling the farmers. Riding up to Mile City, where Trevor Norton lives, Regan finds a murdered sheriff. Arriving in town, Regan is mistaken as the sheriff and is drawn into the complex and often violent conflict. Can he work out how to solve the situation and bring peace to the town, or will his bounty-hunter instincts betray him? Some Dollars for Django is surprisingly well scripted for what is little more than an Old-Westsploitation film. Although even the most casual viewer might figure out that the 'twin brother' routine is unlikely to turn out to be just that, the film keeps you wondering and guessing throughout. The ranchers and farmers seem to have decent motivation for their feuding; too many Spaghetti Westerns just use the Mexican Revolution as an excuse to get big gangs of gunmen attacking each other. Impressively, neither the ranchers or the farmers are shown as being the 'bad guys'. Both sides use violence, and although the ranchers attack more brutally, it is the farmers who seemingly provoke the whole thing by erecting barbed wire fences. Pacing is decent and the films climax does work quite well. However, the film does fall into the trap of many films of its genre - the bad guys take far too long to think about killing the Sheriff - although they are prepared to kill their way around the town, they stop short of trying to kill the Sheriff for too long. The script as a whole has a strong American Western vibe to it and much of this film could be mistaken for an American Western. The production budget was obviously pretty substantial for this film, the interiors and exteriors look great and there are plenty of extras running about, both in the shape of big groups of hoursemounted gunmen, and loads of background characters in the town street scenes. However, the direction is quite poor - the framing is often terrible (although see notes on the DVD) - and according to Enzo G. Castellari (credited here as assistant director under the name Enzo Girolami), the official director (Spanish 'director for hire' Leon Klimovsky') was so incompetent and uninterested in the material that Castellari himself directed most of he film (making this his directoral debut). The fight scenes are very distinctive - like Ferdinando Baldi's Texas Addio (1966) of the same year, the fight scenes seem to have been carried out using pro-wrestling trained stuntmen and you get some very elaborate fight moves, as well as some totally over-the-top gun shot deaths. The music is very much a background affair, and almost unnoticable. Some Dollars for Django is a decent film with some great scenery that does look very American, and some good looking sets. The acting is nothing to speak home about nor is the direction and a rousing soundtrack that boosted so many average Spaghetti Westerns is absent. However, the script is decent enough, and the fight scenes look great. Recommended to Spaghetti fans, but certainly not a good place for first time watchers. (see notes in review) Leon Klimovsky - a workmanlike Spanish director best known for his work with Paul Naschy. Any gore/violence? A little blood. Some over-the top fight scenes that look more like wrestling matches. Plenty of balcony dives and rockface tumbles. 'Seen it all' Spaghetti Western fans should enjoy, but not for newcomers to the genre. Good soundtrack? Unexciting background music. The image at times appears cropped at all sides, although whether this is poor direction is unclear. The picture quality is good most of the time, some light grain, and a couple of scenes seem to be from a lower quality source. Most annoying though, at the top of the image (in the black bars) throughout the film are white markers like tracking markers on a VHS. Audio Original English mono - Dolby Digital - decent quality audio. The dubbing is average although the Django character is inexplicably refered to as Regan. Original Theatrical trailer - 3m 55s - PQ is decent. Very brief on screen text biographies of Leon Klimovsky, Anthony Steffen and notes on the film. Insert liner notes - Spaghetti Western summary. Other regions? Now available on Italian R2 DVD from Minerva, in original aspect ratio with English audio. Also available French and Japanese R2, neither have English options. No additional extra features. Cuts? Cut status unconfirmed. The French DVD has additional scenes, and the montage of footage at the end of this film is the original title sequence. Print used has German title but English credits. An average Spaghetti Western with decent script, action and production, of some interest to fans of the genre. The DVD is flawed, with a cropped, cut print, and an audio track that has renamed Django. The new Italian DVD is a better choice, but this disc is still watchable if it is all you can get. Find more films directed by Leon Klimovsky. All text in this review written by Timothy Young - 4th February 2006.